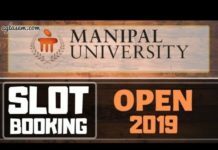 MU OET 2019 Slot Booking – Manipal University has started the MET 2019 Slot Booking from April 05, 2019. The last date to book the slots is April 09, 2019. However, for MSc Nursing course, slot booking starts from April 17 to 19, 2019. 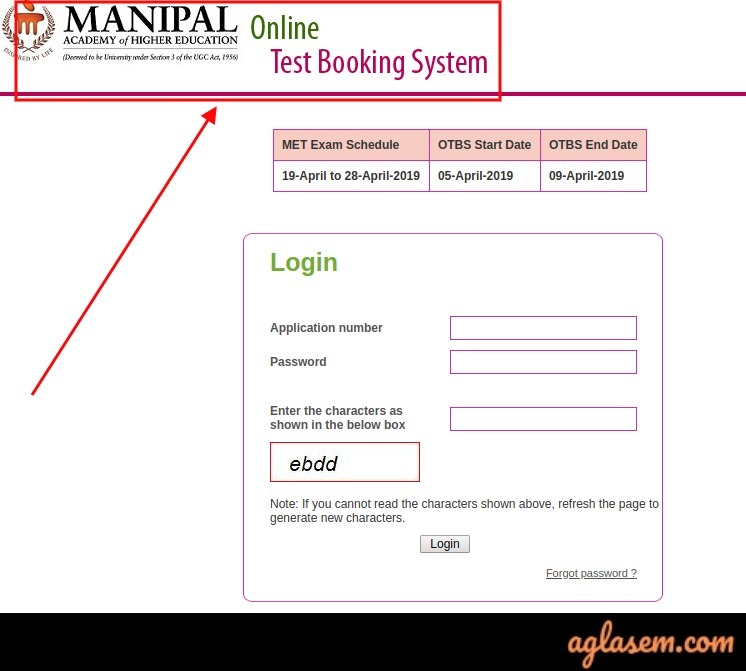 MU OET Slot Booking is hosted at Manipal Online Test Booking System (OTBS). To book the slot candidates need their application number and password. The exam city wise exam schedule is available too, as per which the candidates need to complete the MU OET 2019 Slot Booking, right after which the admit card is issued. Check below the steps to book the exam slots and other important instructions. 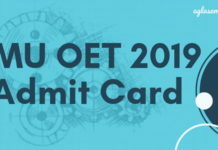 Latest: MU OET 2019 Slot Booking starts. Book your slots for the exam from the direct link below. Book Slots: Click here to access the Manipal OTBS to do the MU OET 2019 Slot Booking. 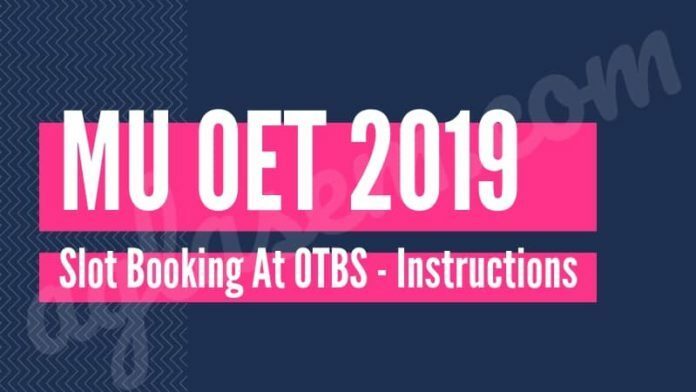 How To Do The MU OET 2019 Slot Booking At OTBS? 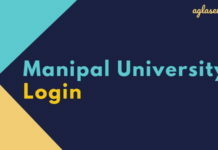 Manipal University has recently launched the demo video on how to do the MU OET 2019 Slot Booking. The candidates can check the same on this page below for a demo of the same. It is important to be thorough with the process so that at the time of slot booking, there are no hindrances. Access the direct link above on this page when as the slot booking starts. Or you can visit the website, manipal.edu and locate the OTBS link. After clicking on the link the candidates will get to select their exam centre, date and time. Note that here the candidates have to be quick as the availability of the slots keep changing every second as the slot booking is done in real time. 1 minute time is available for the candidates to confirm the booking. before confirming quickly check the exam centre name, address, test time and date. Thereafter click on the confirm button. In confirming the booking the admit card appear on the screen. Candidates will get to see the admit card on the screen after the slot booking, click on the generate PDF button to download it. Also, the e-hall ticket/the admit card is sent to you via the registered email. In addition to that, a confirmation message is sent to you after the success of the slot booking. If a candidate is not satisfied with their performance in the MU OET 2019 exam, they can apply for the second attempt too. However, they have to pay an extra charge of Rs. 1400/- while booking the slot for the attempt 2. There is a third attempt too. The process remains the same here, book slot again for a third attempt and pay Rs. 1400 again. Note that, the candidates will get a new admit card for each attempt. If you have done the booking for the first attempt of the exam, then you are eligible for slot booking of the second attempt. If the slot booking for the first attempt is not done then you the candidates are not eligible for the slot booking if the second attempt. If the booking is done before 5 PM, immediate next day will be available. If the booking is done after 5 PM, immediate next day will NOT be available. What Slots Of the MU OET 2019 Exam Should You Choose? Choose a date on which you have no other important exam or other occupancies. Also, while selecting the exam centre check how far is the centre. Choose the nearest one. Check the transport mode to the exam centre. Is the route convenient and will you be able to reach the centre on time? Select the exam date and time when you are comfortable to appear in the exam and when you are the most stress-free. Forgot MU OET 2019 Password? 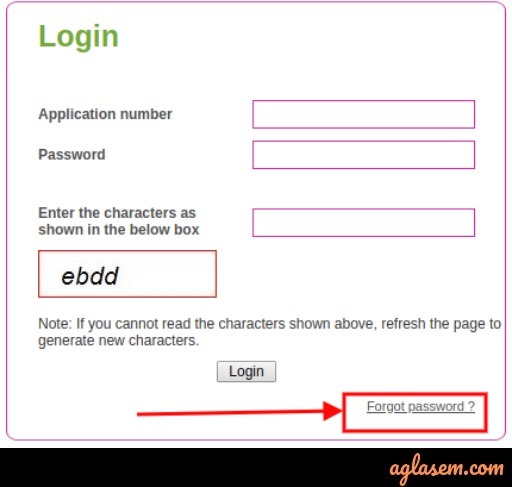 Click on the link that says “Forgot Password” as shown in the image below. After that, the option to enter the application number is asked. Enter the same and click on the “get password” button. Thus, the password is made available to you. What If You Do Not Book The MU OET 2019 Slot? The candidates who do not book their entrance test slots before the last date, get the allotted exam centre, date and time by Manipal University. For such candidates, the University allot the seats from the centre that are yet not occupied or based on other criteria. The disadvantage for such candidates is that they do not get to book their preferred slots and the slots allotted by the University might not be convenient for them. What Is Manipal Online Test Booking System (OTBS)? It is the portal that the university opens when the slot booking of the University starts for the entrance exam. This portal is where the candidate logs in using their MU OET 2019 application number and password. This is the site that also hosts the admit card after the slot booking is done. The exam city and the dates on which the exam is being held there is made available in the table below. Note that using the slot booking system the candidates have to select anyone date to appear in the exam, available in their city. Many candidates face situations that are difficult to understand on the slot booking process. Below are the most frequently asked questions regarding the MU OET 2019 slot booking process. Q1: I can not find the link to access the slot booking. Where do I find it? A: As explained in this article above, the slot booking is done at the OTBS (Manipal Online Test Booking System). It is s whole different portal. However, the official website of Manipal University, manipal.edu, displays the link when the slot booking starts. You can find it there, or you can access the direct link on this page during the slot booking process. Q2: How do I access this portal, if I have forgotten my application login details? A: Near the login window in the OTBS, a “Forgot Password” link is available. Using this link, you can retrieve the MU OET login details. If you don’t have the application number, check your mail in the registered mailbox, where the University has sent you the application number while the registration process was going on. Q3: What if I skip the slot booking. Will I still be able to get the admit card? A: Yes. If you skip the slot booking the admit card will be still available. The University books the slot on your behalf and as per the availability of the seats. The admit card is thus issued without even you participating in the lost booking process. Q4: Can I reschedule the slot once booked? A: No. Once the details of the slots like the exam centre, time and date is submitted, you cannot change it. If you are booking the slots for the MU OET 2019, this clearly indicates you are going to appear in the exam. Thus, it is very important to understand the importance of the preparation in this last moment. The exam pattern varies for all the courses for which the entrance test takes place. However, being an online entrance exam, there are common factors that are applicable to all the courses. Know the exam pattern for the MET you are appearing for. Know the syllabus for the same. In addition to that, check the difficulty level of the question paper by checking the last years’ question papers and analysing it. Also, you can practice the mock tests available online for the same. This will give you an idea of the exam nature, and how to manage time. After booking the slot, the admit card/e-hall ticket appears on the screen as discussed above. The candidates can download the admit card then or later. 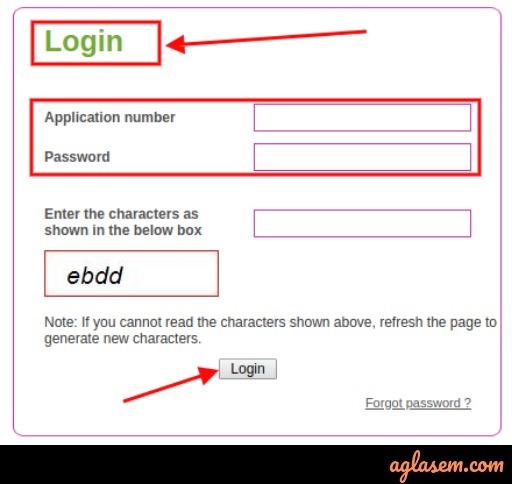 To get the admit card later, the candidates have to login into the OTBS again with the application number and password. A link to get the admit card appears on the home screen of the OTBS. Click on that link to get the admit card. The admit card will have the test centre address, exam date and time as per which the candidates have to appear for the MU OET 2019 exam. The admit card must be kept safe even after the declaration for the result and until the admission process ends.